Six years ago, I was provocatively reminded of the pervasiveness of American culture while I was walking around an outdoor market in Kuala Lampur, Malaysia. Amongst the tables full of trinkets and indigenous crafts, I spotted a Kenny Rogers Roasters chicken joint and heard the megahit “Kiss Me” from Sixpence None the Richer over a transistor radio. The setting seemed almost surreal. There in the center of that Muslim capital city, Malaysians were scarfing down poultry under the grinning face of Kenny Rogers and singing a simple love song along with the angelic and innocent voice of Leigh Nash. The song’s appearance on a playlist on the other side of the globe is not totally surprising. It was a huge hit. While some would dismiss it as syrupy, the rest of the world sang along with the universal longing for a simple kiss. The tune became the most-played song in nearly a dozen countries, landed Sixpence on the late night shows, and found its way onto TV and movie soundtracks. As suddenly as the flame of fame had been fanned, the politics of the music industry extinguished the inferno. Rather than capitalizing on their successful hits, Sixpence’s record label left them dangling in an artistic purgatory. The band’s next album was released without fanfare—with only long-time fans even knowing it was being released. Sixpence amicably disbanded in 2004. Shortly thereafter, Leigh and her husband, Mark, became the proud parents of Henry. With Leigh cutting her teeth on motherhood after 13 years on the road with her male bandmates, her life became a completely new adventure. The record label machinations left her hogtied, frustrated, and slightly vengeful. 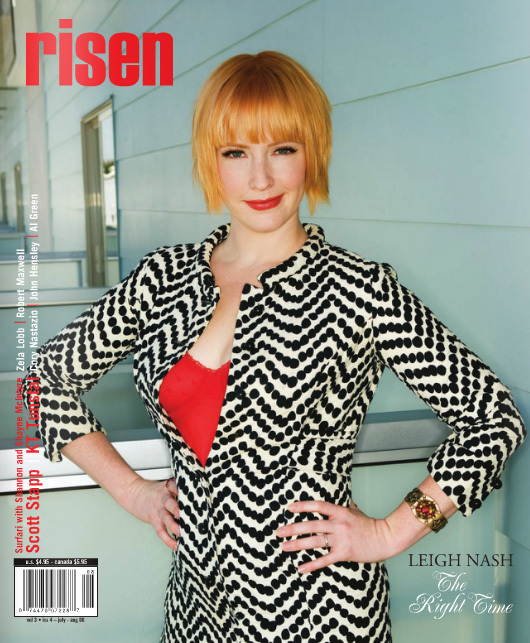 Leigh Nash, however, was not going to go away quietly in the night. She spent last November in Montreal with Pierre Marchand (Sarah McLachlan’s producer/collaborator), working on her first indie solo album. She seems ready for this chapter in her life. When we met at Fido’s Coffeehouse in Nashville, Leigh didn’t strike me as a mommy rocker. She’s unpretentious, charmingly Southern, and fetchingly adorable. She even bought my coffee. A week after our lengthy conversation, I met up again with her in New York, where she was singing at the hipster hangout Arlene’s Grocery in Soho. Hearing her in that intimate setting, I was reminded why I fell in love with her voice so many years ago. As we were chatting after the show, a young woman introduced herself to Leigh and said how much Sixpence None the Richer meant to her as she was growing up. When she was 16 years old, she would steal her dad’s car and drive around for hours listening to Leigh’s melodic vocals. There was sweet relief on the young woman’s face. Leigh’s back. Finally. Have you ever been tempted to sing “Kiss Me” in a karaoke bar? [Laughs] Yes, I have. I have actually done that. I only did it once. It was a dare. No one made the connection that you were actually the one singing your huge hit? How did you begin singing in public? I was really, really shy as a child. But for some reason I really wanted to be on stage and I found myself completely captivated by old country songs like “You Aint Woman Enough to Take My Man”—a Loretta Lynn song—and anything sung by Patsy Cline, George Jones, and Charlie Pride. I called this local dancehall in New Braunfels, Texas, and asked the band that played there on the weekends—they were called the County Line—if I could join them during their set on just a couple songs. They were kind enough to let me. I was about 13 years old. I am sure they thought it was funny or cute. I showed up with my little bolo tie and my painted-on red pants. My parents were always there. They were always very supportive, but they never pushed. I don’t think they could believe it. I was the daughter who could not even speak to people without blushing. Was this a honky tonk? It was a honky tonk—exactly. And on Sunday nights they didn’t serve alcohol. Do you have any lasting memories of that experience? When did you begin collaborating with Matt Slocum? I met him in church. I don’t remember exactly the first time he heard me sing, but there were a few times that I sang a Sandi Patty song in front of the whole congregation. He had been listening to the Innocence Mission, the Sundays, 10,000 Maniacs, Crowded House, and all this really cool stuff, and he wanted to start a band. He took me away from all of that country and got me into the kind of music that I had never heard. It was a whole new education for me. I was 14 when we recorded our first demo. Matt had written a song called “Trust.” He was only 17 or 18 at the time. Musically, we were bonded at that point and were going to do stuff together from that point on. He carted you all around Texas at that age without your parents? Yep, in his little black Toyota truck. We went up and down 35—the north-south highway between New Braunfels and Dallas—almost every week at one point. We were playing at a really cool club down in Deep Ellum called Club Dada. I was about 15. We never got much interest from clubs in Austin—which would have only been about 45 minutes away—but Dallas was four hours away. So, of course, that was where we had to go. Was there ever a romantic connection between you two? You spent more than 15 years on the road with all guys. Describe the weirdness of all that. It was weird, but that is all I had ever known. It felt completely normal to me because I was 14 and as I got older the more touring we did in vans and cars. I was used to being around dudes. By the time that my husband, Mark, came along, I was a pretty seasoned van traveler with all these boys. My best friends were boys. It just seemed to be totally normal to me. I think it became normal to Mark. It never bothered him. He knew the freaks I was out on the road with and that they were friends material and that no one was after me. What does it feel like to be an artist trapped under a contract? It felt like your arms and legs tied behind your back. It felt awful. It seemed like it happened over and over again. Our wings were continuously clipped. If we were still together, I could say, “It made us stronger. Look at us now.” But in the end, it did not work out like that. I like to believe that things work out like they are supposed to. I wish it could have been one of those situations where we were together for 25 years and still best friends at the end of it all—we still are all really good friends—but we lasted a good long time. I wanted it to last longer, but now that I have made my own record and have some independence I am really thankful and I think it was the right thing. You sound like you’ve dealt with it, but surely this was good cause for depression. It was frustration about not being able to get answers. At the time, our manager was doing a great job and was trying to get it worked out. It was not his fault. They kept saying, “You should hear something this week.” It was always six months away. It was never that week. I was just mad at the process. It was always like, we are waiting to hear this. We are waiting to hear that. Just another week, another week, another week. That’s what drove me insane. I think that if somebody would have said, You guys are screwed and its going be two years, I could have made better use of my time. It always seems that way in this business. You are just waiting on some jackass to make a decision. It is ridiculous. What percentage of your new album is revenge at the record label and what percentage is your need to create? I would say revenge is two percent—really and truly. It’s in there. I want it to go super well without a record label. The rest is wanting people to hear this music and find a connection with it and love it. I want to be heard three or four times a day on a pop hits radio station. I wanna be like Rod Stewart! Where did you see God in the midst of that fiasco? Were you mad at Him? No, not at all. The picture in my head is of a young colt jumping and writhing around in a little pen, but if it were to get out it would hurt itself. The pen is there for a reason and the owner is standing there. What can you do? The colt can calm down, have some water, try to learn to read [Laughs]—get some other skills. I was just fighting and fighting and fighting. I think that you either have to grow from something like this or destroy yourself. I think I probably did something in between. Hopefully, I grew from it as much as possible. I didn’t fall into any destructive behaviors as a result of that anger. So I guess I did grow from that, so that is good. You learn patience. Eventually, you have to sit still and learn to observe what is going on around you. In those years, I made some of the best friends that I have had in my life. I learned to not hold on to what I want so hard that God can’t still mold me and I have to have my hands open so that he can give me stuff. If you are clinching what you want so bad, He can’t get your hand open. You have to open your hands. I am still learning to do that. It is really hard. Compare motherhood and creating a new album. I think there’s similarities in that you don’t go into it knowing exactly what you’re doing; it’s just instinctual. I think Mark and I together are doing a really beautiful job with our son, just following our instincts and just trying to be good to him and to be good parents. Making a record is kind of the same thing. You go into it, and I was never that hands-on. In Sixpence I was always in the studio, but I was very intimidated by the process of recording and I had never played any instruments on a record, because I’m not a good enough guitar player. So that kind of removes you, too. So when I went into this, I’m really thankful I got to work with [celebrated producer] Pierre [Marchand]. He’s a master at making a record sound beautiful. And he certainly did that with mine. But, with this too, the writing, the record, the whole thing, I just followed my instincts, just like with my son, Henry. And hopefully the payoff will be as beautiful as my child is. What is the one thing that you have the desire to teach Henry? Whether we end up in a trailer down by the river or we do well, I want him to be proud of who he comes from and where he comes from. And I want him to have a good sense of himself. What was your home life like as a kid? We were stressed out. But there was a lot of love and a lot of support and a whole house full of grace. So it wasn’t all bad. But it definitely was not…hmm…. It was stressful. Was music an escape for you? Yeah, definitely. Matt and his music and definitely it was God’s hand that brought the two of us together. It was my savior. Well, I mean, Jesus is my Savior. But it saved me from…I don’t know what. But it was definitely a miracle. Are faith and creativity at war with one another, or do they walk hand-in-hand? At this point in my life I guess I don’t really know. I mean, I think that my faith makes me who I am. And so whatever I do, that’s what I walk with. It’s this amazing faith and this belief that is stronger at some times than others. But I still carry it with me and it changes who you are. I mean, it’s everything. So I think they walk hand-in-hand, absolutely. I read on your blog that you consider Leonard Cohen your boyfriend. Leonard Cohen has put a stake into my heart. And I’m so sick of it. But I’m this typical, you know, victim, and I’m just going to take it from him. I love him that much. He’s old now, and he’s got other things on his mind. But if he was smart he’d wise up and give me a call. Neil Diamond’s new record is amazing. And one of my favorite songs, I don’t actually know what that song is called, but the lyrics from it that I love so much are: “If your goldmine comes up empty, I’ll be there to work the claims; If you’re captain of a shipwreck, I’ll be first mate to your shame.” That just gives me chills. You are also a Golden Girls fan. Why? Oh my gosh, yes! I totally love The Golden Girls! The show is awesome because it makes you feel safe. It’s some of the funniest stuff I’ve ever seen in my life. Those ladies have the best timing, and some of the best writing ever was done for that show. You have a song on your new album that deals with heaven. What actually is your view of heaven? I think just the main thing that would be heaven to me would be knowing everyone that I know here and recognizing them and being able to talk about the stuff that’s gone on and laugh about it and tell stories and, you know. It’d just basically be like Earth, but without the pain and the suffering and all the bad stuff. Because Earth did a great job with us. And I hope we’ve all got our faculties about us and we can still be funny or smart or whatever our gifts were here, that we could just share them with each other up there without all the weird stuff. © Steve Beard and Thunderstruck Media Syndicate. This interview originally appeared in the July/August 2006 of Risen Magazine.